Seniors need healthy, well-balanced meals. Colorful: Eat a wide variety of foods with lots of color. Dark greens are antioxidant rich, deep oranges found in yams, carrots, and squash provide lots of vitamins and nutrients. Make the plate colorful and fresh for a higher level of health. Whole foods: Seniors should focus on eating whole foods, such as whole fruits rather than just the juices. This will provide greater fiber and vitamin value with each serving. Calcium rich: Bone health is important for older adults, as the need for calcium increases with age. Look for calcium-rich sources, and not all dairy. Non-dairy sources include things like broccoli, almonds, and kale. All of which are great for aging bodies. Water: Many older adults lose their sense of thirst, and the result is dehydration. The ability to regular fluid levels and sense thirst can decline with age, thus being aware of water intake is key to healthy living. Keep a water bottle handy, and track how much you are getting each day. Vitamins: Eating vitamin rich foods is essential to good health, aging often means less ability for the body absorb vitamins, such as B-12, thus getting the recommended daily amount may require supplementation, or a careful planning of vitamin rich foods. 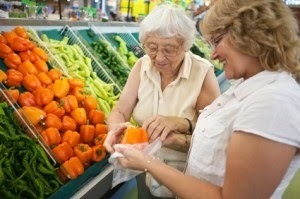 Most seniors who eat a good balance of fresh vegetables will not have this problem. Reduce sodium and processed grains: Prevent high blood pressure and water retention by reducing sodium intake. Reduce the amount of refined sugar, white flour, and other grains and carbs that are stripped of their nutrients, they often digest too quickly and can cause spikes in blood sugar and dips in energy levels. Instead focus on whole grains. Add fiber, good fats, and nutrient dense foods: Get your energy up, your skin healthy, your cholesterol where it should be, and your bowels working properly with raw fruits, veggies, whole-grains, beans, and healthy fats like avocados, and salmon. Talk to your doctor or a nutritionist for details about what your diet should contain based on your specific health needs. If you find that eating healthy, well-balanced meals is a challenge, consider Mom’s Meals, or some other home delivery option. Mom’s Meals offers over 70 different freshly prepared meals delivered directly to your home. They are developed with senior nutrition in mind, and you can mix and match to only get the foods you like.